PRE-HEAT the oven to 200 degrees Celsius or 390 degrees Fahrenheit and LINE the oven tray with parchment paper. RINSE the zucchini, remove the top and divide them in halves. Use a sharp knife to create slices into the zucchini, but don’t cut it all the wat through. PEEL the onion and garlic cloves and divide them into halves as well. DIVIDE the halved onion and garlic cloves over the oven tray. DRIZZLE the eggplants with olive oil, pepper and salt and place them with the cut-side down on top of the garlic. CHOP 1 lemon into halves and place it with the cut side upwards onto the oven tray. ROAST the eggplants, lemon, garlic and onion for about half an hour. 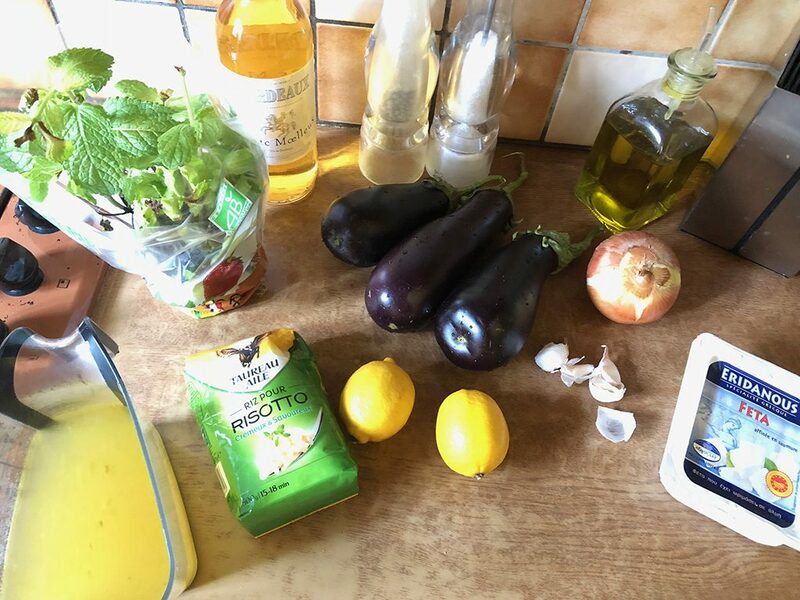 The exact time depends on your oven, the eggplant should be completely soft. CREATE a puree of the soft inside of the eggplants and the onion and garlic. HEAT a dash of olive oil into the large skillet and sauté the rice for a few minutes. 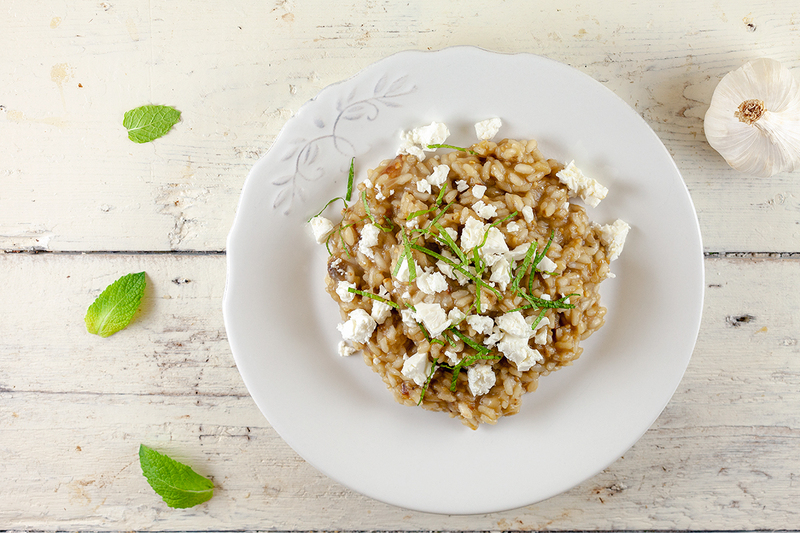 As soon as the rice is glossy, pour in the white wine along with the roasted lemon. POUR the vegetable stock in batches into risotto. STIR occasionally and add the next spoonful of stock as the previous one is completely absorbed by the risotto. 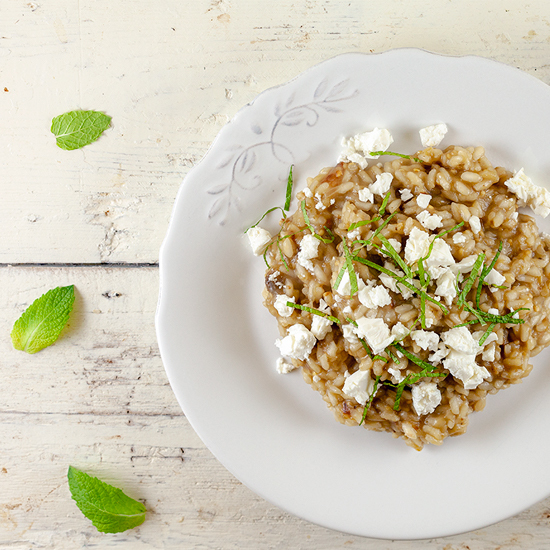 It’s possible the risotto is already done before you used all of the stock. REMOVE the roasted lemon and add the eggplant puree along with the juice of 1 lemon. SEASON with pepper and salt. 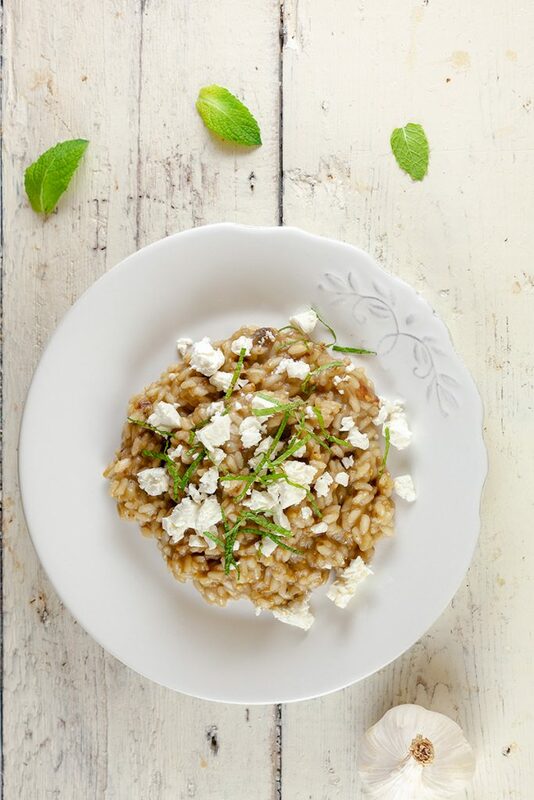 Finely CHOP some mint leaves and the risotto with mint and feta. Enjoy!